Throughout route asphalt covering makes 2km, covering of gravel – 24km, improved earthen road-28km, dirt road-6km and difficult passed dirt road – 3km. A relief mainly equal, with separate lifting and descents. The big lifting is before Skaista, but before it will be pleasant descent. Also there are dirt roads and hard passed dirt roads on route, but they should not deliver special difficulties to bicyclists without dependence from weather conditions. It will be more unpleasant if on these roads during bad weather conditions recently passed agricultural machinery. In separate places at Sivers difficulties can arise because of strong wind when it blows from outside lakes. As Dridzs is narrow and is situated in a deep hollow, than wind will be felt less here. Any physically active person can overcome this route. To children, at the age from 10 till 12 this road can seem too long and tiresome. Certainly, it depends on character of the child and its physical preparation. Shop visiting needs to be planned in Skaista, as there are no shops in other places. There is small booth in Sauleskalns, but assortment of goods is very limited. Tubes and other necessary details of first necessity are required to take with you. Possibilities for comfortable spending the night are limited. 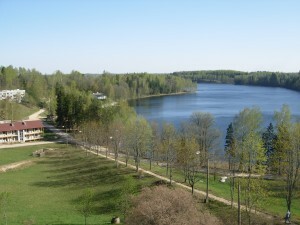 It is possible on tourist base of Sauleskalns, in a camping of Kaziņči, on the bank of lake Sivers and in a rest complex „Dridži” near Skaista. But it is always possible to find places for tents, only at first you need to arrange with land owners. 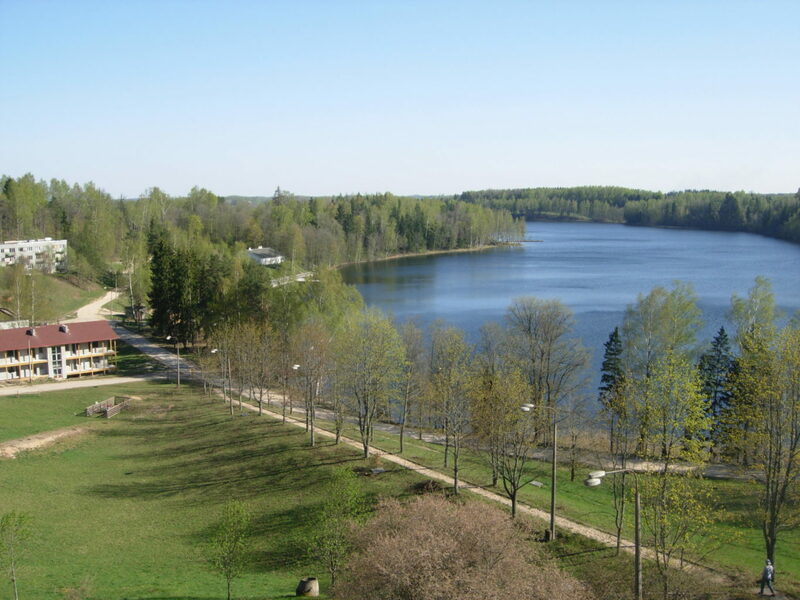 Most convenient it is to begin the trip at the Sauleskalns tourist base. Here you can easy leave the car and if necessary also stay overnight. However, before you should contact the owners of the base. We begin the trip with driving up the hill – past the apartment houses along the bank of Drīdzs creek. When going out of the wood and reaching the clearing on the right we see the lake Ota. After 2 km we arrive at a crossroads where we turn left. 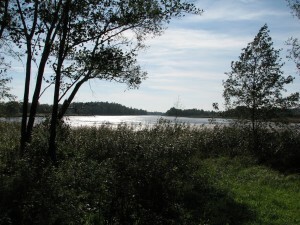 On the right side we see the Soleimi creek of the lake Ārdavs, after another 1 km beautiful landscapes greet on the 210 m high Sauleskalns and on the lake Dubiņš at its foot, and also on the creeks of the lake Ārdavs. Further follows a small descent and after another 1 km we have reached the road Kombuļi-Auleja. 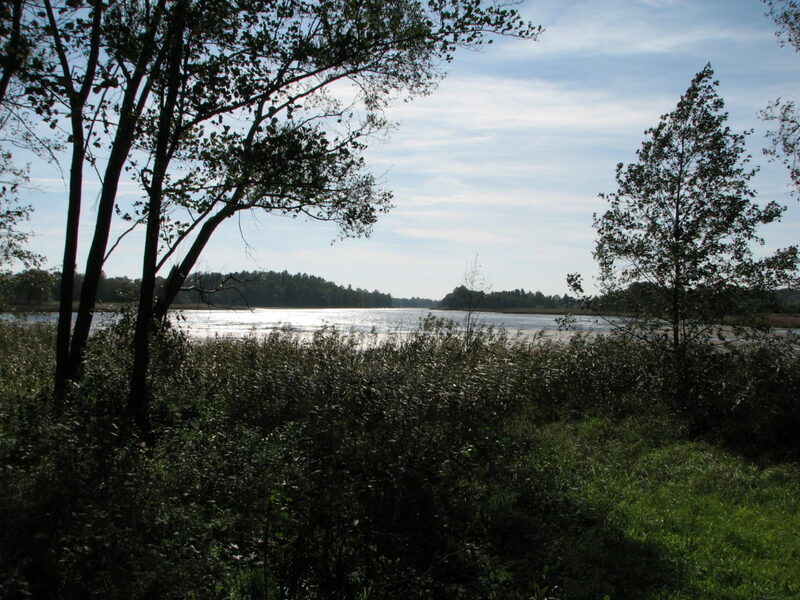 Ahead we have the small lake Joda, but having gone a bit on Auleja side on the same side we see already the Guļbiņš. After 3 km we reach the turn to Vanagi. Shortly before that we have crossed the river Dubna, before that on the right side we could see the next in turn creek of Ārdavs – this time it is Ārdavs leg. Having gone ca. 1,5 km along the Vanagi road immediately after Krūgeri cemetery on the right side we see an impressive hillock – it is Brāslava castle mound. At the foot of the castle mound there are houses and a good path leads to them. You definitely must climb on the Brāslava castle mound – fabulous views greet there from on the lake Sivers and its surroundings. Local inhabitants celebrate Midsummer Day on the castle mound and here is lit the Ligo bonfire. The river Dubna flows out of lake Sivers at the foot of the castle mound and it is very convenient to start the water tourism route here. Having enjoyed the nice sceneries we continue the way and after 2 km we arrive at Vanagi crossroads. Here we turn right and continue the way as close to the bank of the lake Sivers as possible. The road has obtained recently new gravel syrfacing and together with the nice sceneries it gives emotional pleasure. On the way we can observe the mode of life and construction traditions of Latgallians – in this span in the stretch of 6 km we go through several small villages with names Plotie, Rubeņi, Drongāni, Māteļi, Kiški till in Bleideļi we arrive at crossroads with Auleja – Konstantinova road. Here we turn right and go to Sivergala. Totally in the route we have covered approximately 20 km. In Sivergals it is possible to go to the Bleideļi creek. It is the longest and narrowest creek in the lake Sivers – the length thereof reaches 2 km. Having seen the creek we go further and at the former farm complex we turn right. The road goes on the South and after 3 km comes quite close to the bank of the lake. Here it is possible to completely enjoy the beauty of the lake Sivers! Landowners have arranged here a nice resting-place. Having asked for permission, perhaps the travellers are also allowed to rest here and enjoy the nice sceneries. Having gone ca. 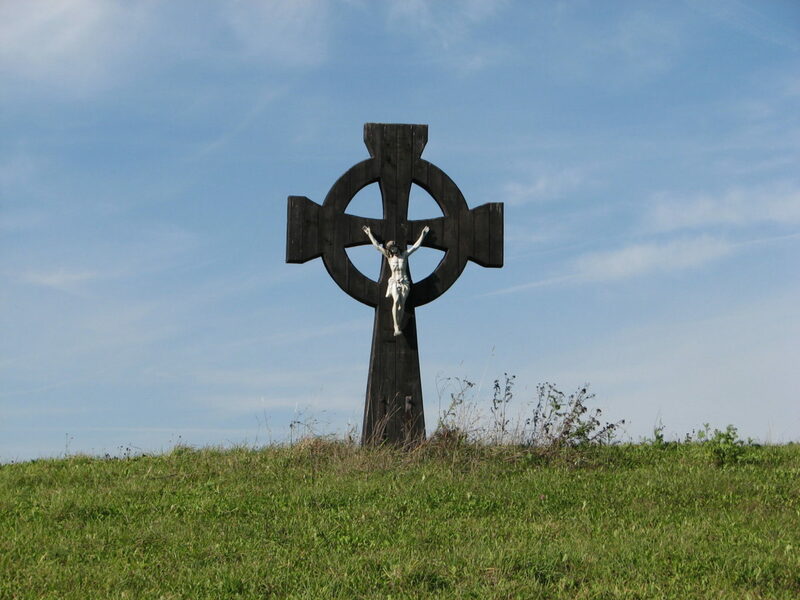 1,5 km on the left side of the road a peculiar crucifix is place that associates with the crosses of ancient Celts or Vikings. On the right there is the northern-east utmost creek. Further we have to continue the way to Lozdi and ca. after 1,7 km behind the abandoned houses we must turn right and continue the way along the “back” of the hillock through pasture on a non-surfacing road. Separate roads shall branch off on the left, but we have to keep right and after ca. 1,2 km we shall reach a good gravel road and after another 2 km we arrive at a motorway on crossroads. Totally in the route we have covered ca. 29 km. In the crossroads we turn right and go 4 km to Stoli cemetery. On the way we can enjoy the scenery of the lake Sivers. Before Kazinči there is a turn on the campsite. Behind the Stoli cemetery on a farm track we turn right and we continue the way keeping as close as possible to the bank of the lake Sivers. In this span on the road you can see grass-snakes, particularly active they are on sunny days when they like to lie on the warn sands. We continue the way to Luņi. Here our way is obstructed by a high fence. Behind the fence there are possessions of the former owner of Parex bank that occupy areas around the lakes Ārdavs, Ots, Sīvers and Drīdzis. Common people are not allowed to be in these possessions and it means nothing that cordage zone law is valid – laws are not equal for everyone! At the gates of the fence we turn left and we continue the way along the fence in South direction. After 1 km we reach crossroads where we turn left. Now the deepest lake in Baltics – Drīdzs (65,1 m, according to latest information 63,1 m) is in front of us. Here begins our tour around the lake Drīdzs. It must be marked that the bed of the lake Drīdzs is narrow and formed in deep valleys between the hillocks. 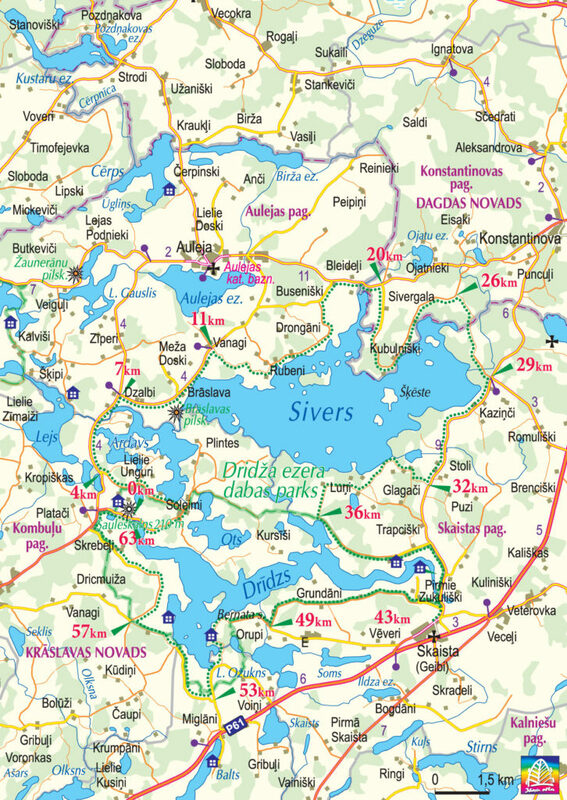 Although our route goes close to the bank of the lake here it will be more difficult and seldom to see impressive natural landscapes with Drīdzs in the centre as it was on the bank of Sivers. After 4 km we have reached Skaista – Konstantinova motor road. The remaining 3 km to Skaista are very scenic. 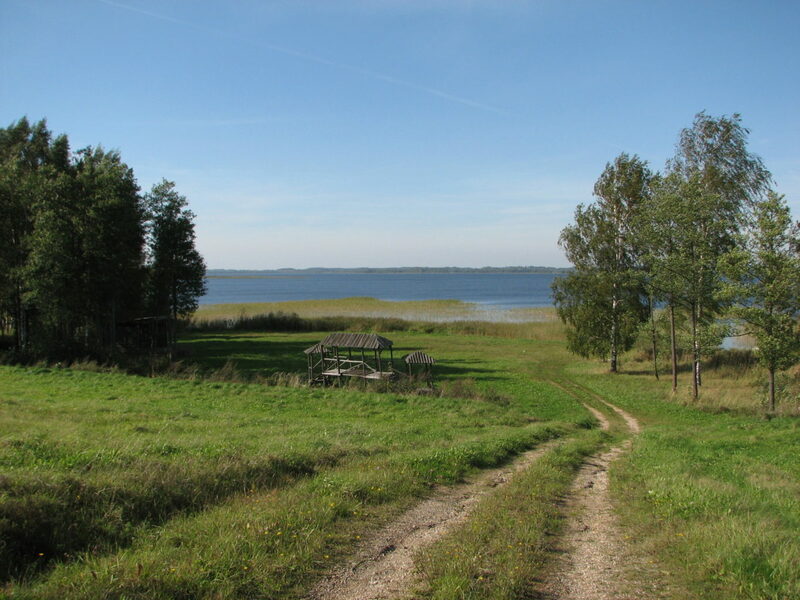 Here we can see splendid scenes on the hillocks of Latgale and eastern creek of the lake Drīdzs that is as narrow as a river at this place. Nice in our route is the biggest populated area and centre of Skaista parish of Krāslava county. Circa 900 (937 inhabitants in 2000) inhabitants live here. If it is necessary you can shop in the local stores. In Skaista we see the Roman Catholic Church. The first wooden church was built in Skaista in 1788 (according to other information in 1778). 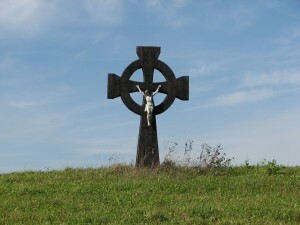 In 1914 the church was moved to Geibi village where during the First World War it burnt down. In 1920-1921 the dean Šinkelis built the present corner-jointed church and established a parish. Totally in the route we have covered 43 km. Having seen Skaista we go a bit back along the Skaista – Konstantinova road and turn left – here also is a mark to the recreation centre „Dridži”. If you don’t plan to manage the route in one day then it will be very comfortable to stay overnight at „Dridži” and continue the route on the next day. When turning on the mentioned road we can enjoy one more time the Drīdzs and impressive scenes of locality. Further follows a descent and we continue the way along a farm track to the 3,5 km distant Grundāni. Here on the left behind the houses we can se very well the Grundāni castle mound that well stands out on the joint scene. The first person who investigated and described the castle mound was Ernests Brastiņš in the twenties of the last century. In the picture of that time it can still be seen that the castle mound is without overgrow and it was ploughed except for northern-east side of the castle mound because it is sheer, but now it is covered with a thick wood. According to general appearance this is a solitary castle mound in a low place. The height thereof from the foot to surface is ca. 20 m. There have been terraces on the sheerest sides of the hill in place of what now there are left just flat cavities. When excavating an occupation layer was found. Particularly black and deep this occupation layer is on the south side of the hill. Different chips of dishes and other usual remains of castle mound life were found there. It is said that rings, axes, necklaces and money were also found here. All things that were found before the First World War were sent to Petersburg. Perhaps this hill was used as a cemetery during the recent Iron Age. 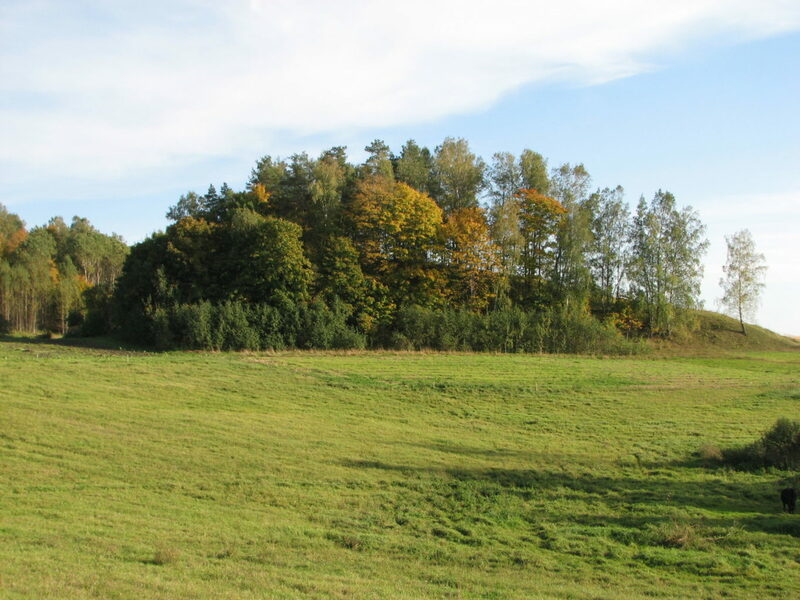 A legend tells that in former times a castle stood on the Grundāni castle mound. It sank in the hill. One cannot dig in the hill. Once the boys dug and saw that someone had stuck out from the hill life black fingers. We continue straight to Orupi and we arrive at a T – form crossroads. From Skaista we have covered ca. 6 km. On the crossroads we turn right and continue the way along Čenčupi cemetery. The road becomes more and more deserted till it turns into two trails crossing the pasture. However this span isn’t long – ca. 0,5 km and having crossed a ditch we arrive at a sign of private property and a good ground road. On the left from us the lake Mazais Ožukns remains in the wood. We go straight and after another 0,5 km we reach a gravel road where we have to turn right. Soon on the right side we can see the lake Drīdzs. This is the utmost southern creek of the lake Drīdzs. Someone has unsuccessfully begun here a construction, but now all is abandoned! We continue the way and after 1 km we reach Pārpuči. Here we turn right and along the Veceliški cemetery we go to Plociņi. Here is a sharp curve. In this curve behind the houses we turn right and along a non-surfacing road that is driven over the pasture we continue the way in straight direction. The span of non-surfacing road lasts ca. 0,7 km then it becomes again well passable and after another 0,7 km we have reached crossroads where we have to turn right. To the crossroads we have covered in total 57 km. We continue the way to Pīzāni. 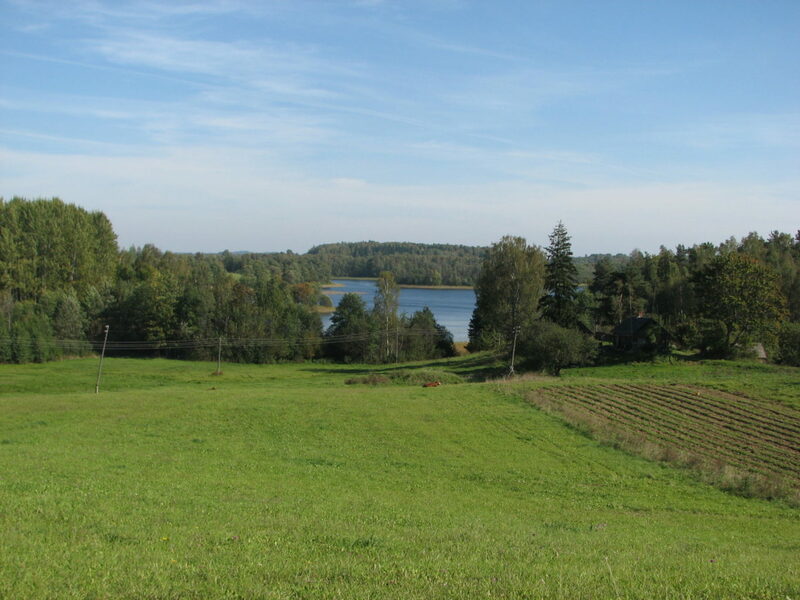 In Pīzāni on crossroads we can see nice scenery back to the creek of the lake Drīdzs and the hills and valleys of Latgale. 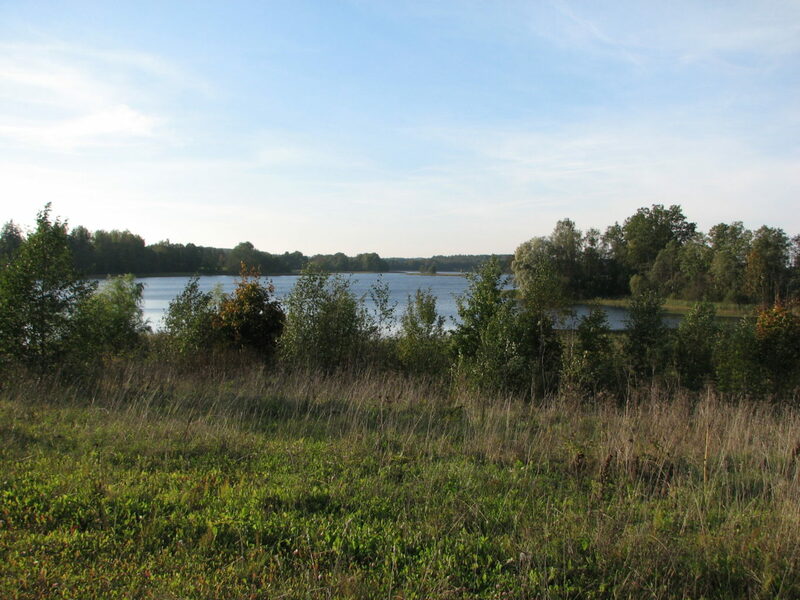 In Pīzāni we have to turn left and go 2,5 km till we reach Kombuļi – Auleja motorway where we turn right and go to the mark on Sauleskalns, by turning where we arrive at out starting place – Sauleskalns recreation centre. Totally in the route we have covered 63 km.